This section determines if records about product, services and project are being kept for future references in the present system and the expectations of a future system. This question identifies if the present system provides information for project debriefing and follow-up in comparison to the future system. Availability of information for project debriefing and follow up shows that reference is made to past activities or occurrences to avoid making the same mistake. Thus it indicates if there is an organisational learning tendency. 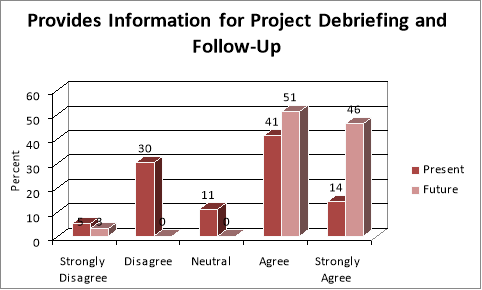 The present system does not seem to adequately provide information for project debriefing and follow-up with 54% that agree (41% agree and 14% strongly agree) and 35% that disagree (30% disagree and 5% strongly disagree) with the statement. In contrast, 97% consider (51% agree and 46% strongly agree) that the future system will provide information for project debriefing and follow-up. This question indicates if there is a knowledge sharing environment in the present system in comparison to the aspiration of the future system. There is a clear distinction from knowledge share and information sharing. This shows that employees are not only willing to share information but also their knowledge for the benefit of customers and the organisation. This portrays if the organisation is open in its approach and culture. The figures show that 51% agree (41% agree and 14% strongly agree) that the present system promotes a knowledge sharing environment in the organisation. This is the lowest rating for the present system in this section showing a lack of knowledge sharing. On the other hand 90% believe (41% agree and 14% strongly agree) that the future system will promote a knowledge sharing environment in the organisation. Silo-based organisational myopia must be replaced with a customer-focus one so that departments will collaborate rather than compete with each other. A customer-centric model requires sharing the data throughout the enterprise; this usually requires a fundamental paradigm shift in the culture to sharing information and knowledge. Many of these changes efforts can be aided by effective communication throughout the entire project and targeting and reaching all levels of employees. (Injazz J. Chen and Karen Popovich, 2003)(Refer Literature Review, Pg. 29, Paragraph 3). This question asks respondent if the present system provides technical details on product and services in comparison to the future system. This shows that if an employee or a manager is not aware of a particular specification, is he/she willing to go on the system and find out about the technical information. 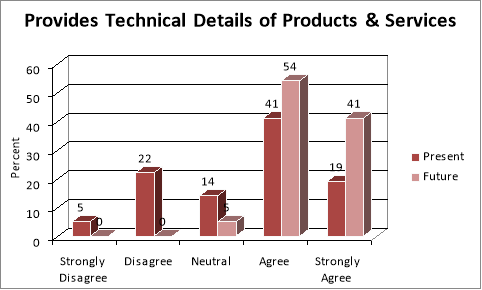 The results show that 60% agree with the statement (41% agree and 19% strongly agree) that the present system provides technical details of products and services. In comparison, 95% agree (54% agree and 41% strongly agree) that the future system will provide technical details of products and services. It was noted that no respondents disagreed with the statement that the future system will provide technical details of products and services. This question compares the present system and the aspiration of the future system, in term of referring to past resolved issues to solve problems that the firm is currently encountering. 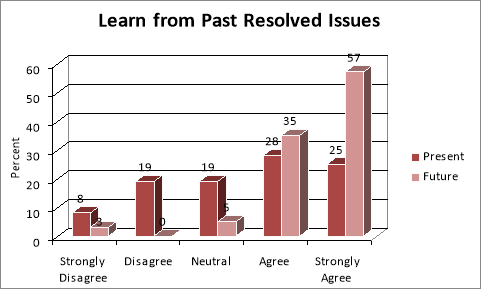 Only 53% (28% agree and 25% strongly agree) of respondents agree that the present system helps them to learn from past resolved issues and 28% disagree with the statement (19% disagree and 8% strongly disagree). On the other hand, 92% agree (35% agree and 57% strongly agree) that the future system will help them learn from past resolved issues. This question basically checks if the present system promotes learning new methods for success in comparison to the aspirations of the future system. This in turn identifies if respondents are willing to learn. 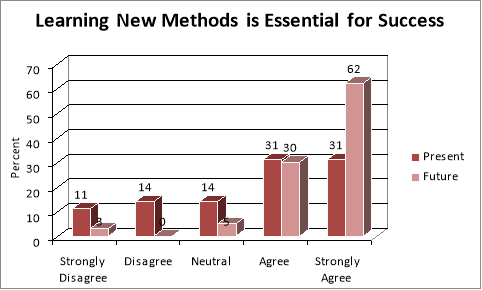 The figure indicates that 61% agree (31% agree and 31% strongly agree) that with the present system, learning new methods is essential for success. Yet, 92% agree (30% agree and 62% strongly agree) that the future system will provide opportunities for learning new methods which is essential for success. From the literature review, Laudon & Laudon (2004) highlight that organisational learning in support of change requires the acquisition of complex knowledge of new business rules and processes and the ‘unlearning’ of the previous ones. This question tests if learning new methods is essential for success indicating that respondents understand the importance of learning. ) (Refer Literature Review, Pg. 30, Paragraph 3). It has to be highlighted, that 35% disagree that the present system provides information for project debriefing and follow-up and only 51% agree that the present system promotes a knowledge sharing environment. The highest rating for the present system is 61% that agree that learning new methods is essential for success. It has to be noted that all the ratings for the future system in this section is above 80% with the lowest rating 89% for promoting a knowledge sharing environment in the organisation. This evidently shows that employees understand the significance of a knowledge sharing environment. Embracing a CRM business strategy requires more than the development of a mission statement, it requires employees to acknowledge it, believe it, and understand how the strategy will change the way they do their jobs. Within Royal Bank, the training of employees to deliver a true customer-focused business strategy is acknowledged to be the most critical aspect of the CRM implementation (Kathleen Khirallah, 2001). Busyshop.com regards employee learning as an investment, essential to sustainably address customer problems and satisfy customer demands. (Hsin Hsin Chang, 2007). MOCOTO Bank believes that, given the competitive nature of the finance industry, and its high degree of IT dependence and innovation, continuous employee learning is an essential investment. This question determines if the respondent understand the importance of a CRM in their daily task. 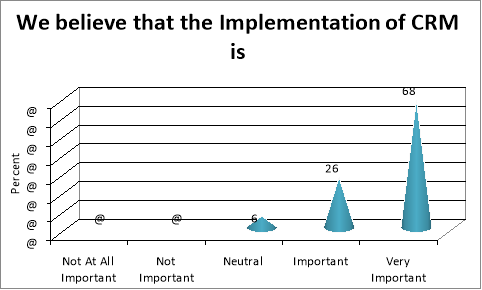 From the survey 94% consider (26% important and 68%% very important) that the implementation of CRM is important, with only 6% neutral. No respondents disagree with the statement. The Literature review also highlights that, CRM does much more than just track customer interactions. It also helps organisations optimize their operations by automating routine tasks and standardizing best practices. Ultimately, CRM allows organisations to better acquire, manage, serve, and extract value from their customers while improving operational efficiency something that is critical in today’s economy (Microsoft Dynamics, White Paper, 2009) (Literature Review, Pg. 9 Paragraph 3). CRM does much more than just track customer interactions. It also helps organisations optimize their operations by automating routine tasks and standardizing best practices. Ultimately, CRM allows organisations to better acquire, manage, serve, and extract value from their customers while improving operational efficiency something that is critical in today’s economy (Microsoft Dynamics, White Paper, 2009) (Literature Review, Pg. 9 Paragraph 3). Open ended questions are used to obtain more insight into the problems of organisations and the recommendations that respondents would like to propose. Question 44: What are the main difficulties in carrying out your responsibility in your department? Table 4‑1: What are the main difficulties in carrying out your responsibility in your department? It is noted that the problems are three folds, either strategic, system related or employee related. Strategic issues that were pertinent were: lack of information, information needed for decision making, proper management of information, issues with planning, cooperation, coordination and the process itself. Other concerns were that the system was slow, need for training regarding communication channels, lack of communication channels, planning issues. The present system is not user friendly with no proper graphical user interface and limited functionality. It does not track customer complaints effectively moreover respondents have difficulty in following up issues in a timely manner (time and resource management). The system is also complicated with too many passwords to remember. On the human aspect, some consider that there is too much work load, follow-up of employees is tedious, the need for implementation of a systematic and coherent culture throughout a large organisation. It has noted that respondents have difficulties in managing customer attitude and perception. There tends to be limited resources and human approach – indicating organisational culture issues. Issues with managing people, low team spirit, lack of training. The difficulties enumerated demonstrates that strategic, system and employee related issues impact on the efficiency of the organisation and should be considered when implementing the CRM system. Likewise the recommendation also tends to be in three folds: strategic, system and employee related. There is a need for a tool that can bring efficiency in back office while ensuring visibility on overall operations. In addition there is a necessity for inter department meetings and regular meetings – basically a more reinforced communication and collaboration between departments. Equally important is proper planning, training and support to achieve business objectives. Respondents expect the new system to provide flexibility while doing several tasks at the same time. It is evident that an upgraded system is required which will necessitate training. It requested that the system is designed as per respondents’ requirements. Essentially the system should enable respondents to manage several tasks at the same time. The new system is also expected to enhance quality output for any task assigned, linking time sheets, complaints, warranty, maintenance scheduling, blacklisted clients in other departments, claim back up among others. In addition the CRM should be updated daily – which should be a prerequisite. There is a need for a proper and organised procedure to manage and distribute information and follow-up issues in a timely manner. As seen above the recommendations are three folds where the system is a major limitation, hampering strategic progress and creating frustration due to an out-dated system which is no longer aligned to the actual requirements of the organisation. In turn the present system does not facilitate strategic analysis and is concerned mainly to facilitate operations. "Organisatonal Learning Research Project." UKEssays.com. 11 2018. All Answers Ltd. 04 2019 <https://www.ukessays.com/essays/project-management/organisatonal-learning.php?vref=1>. "Organisatonal Learning Research Project." All Answers Ltd. ukessays.com, November 2018. Web. 20 April 2019. <https://www.ukessays.com/essays/project-management/organisatonal-learning.php?vref=1>. UKEssays. November 2018. Organisatonal Learning Research Project. [online]. Available from: https://www.ukessays.com/essays/project-management/organisatonal-learning.php?vref=1 [Accessed 20 April 2019]. UKEssays. Organisatonal Learning Research Project [Internet]. November 2018. [Accessed 20 April 2019]; Available from: https://www.ukessays.com/essays/project-management/organisatonal-learning.php?vref=1.